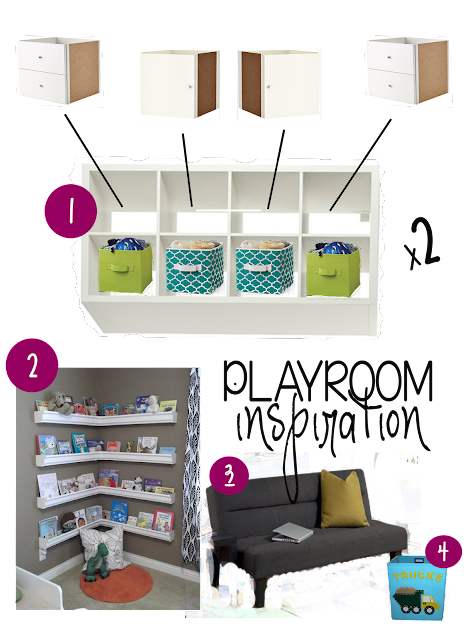 My Christmas Wish List: Playroom Storage! Yesterday I shared some toddler Christmas gift ideas (+ stocking stuffer ideas! - for santa!) over at the darling He & I blog. I thought today maybe I would share with my my Christmas wish list! I totally never thought I would be one of those people who asked for house stuff for Christmas. Last year was our first Christmas that we owned a house and even then I thought asking for house stuff was so boring. And then. Our playroom storage situation (or lack thereof!) became disastrous. You want to see? I'm even a little embarrassed to show you. No judging! AHHH. And this is with almost everything "put away!" Minus the few toys right in the middle of the room. Everything lining the walls is in buckets or boxes or against the wall in it's "spot." And so my mind started spinning with all the possibilities. Enter Pinterest. This picture became my main inspiration for storage. Those Ikea Kallax shelving units? Love love love. I also loved the idea of baskets in the bottom shelves and then when I found out you can buy drawer and cupboard door inserts for the Kallax series I was seriously sold. Cubbies + drawers + baskets + cabinets? I'm giddy. I have an entire (very professional) drawing of the playroom and where all the storage will go BUT. I have to leave you in some suspense for the reveal after Christmas and so today I'm just bringing you my inspiration board! 1. Kallax shelving unit in white | Kallax cabinet doors | Kallax drawer inserts | Better Homes & Gardens storage baskets. We plan to have two of these units in the playroom and they will house basically all of the toys. Because I'm a total list-maker I already have written down which toys will go in which drawers/cabinets/baskets haha! And while I'm sure I've missed a few toys in the line-up, I have several leftover (empty!) drawers and cabinets and bins! I'm pretty happy about that. Then again...maybe that is a bad thing. More room for more toys?! AHH. 2. Rain gutter bookshelf. Loving how this is such an inexpensive way to display your books. Plus it seems easy for Jack to find the books he wants (and also hopefully easy for him to put away!). I also love that I can put board books toward the bottom within little arms' reach and nicer books up higher within mommy-only reach! 3. Futon. This may not be included in my Christmas gift (I do have a birthday just six days later!) but we would love to add a futon to the room to double as a seating area and also a place for all those guests who come to visit to sleep (sense the sarcasm). 4. Labeled storage bins. Loving how the pictures on these bins would make it so easy for little ones to find their toys really easily and to clean up on their own! Because I've become pretty experienced in working with felt after making Jack's quiet book, I think I'm going to attempt to DIY these but if you're not that type (or just don't feel like taking the time!...I do not blame you!) you can find all sorts of cute ones for sale here. OH. and PS we had a painter come out to give us a bid on changing all that cherry molding to white. I have to say I do love the cherry and making the decision to go white and ruin the integrity of the wood was not easy BUT the dark wood just does not go with the cheery, playful feel I'm going for. And so white it will be! I knew that if I wanted my playroom storage plan of action to be put into effect anytime soon that it was going to have to be my Christmas. And you know what? I'm actually really, really excited about it. The boys and I spend lots of time in the playroom during the days and I'm really excited for it to be a functional, clean & TIDY space where we can play, explore, learn & read! If you're looking for more playroom ideas head on over to my playroom pinterest board. And make sure you stop back by after Christmas for the big reveal! What ideas have you come up with for storing all those toys?! Oh my gosh I love that! What do you think it is that they used to create it? I can't tell! I definitely want to find a way to incorporate something like that as Jack is getting TONS of coloring supplies for Christmas! Oh HA! I see it's in the description. I was too excited haha! Perfect timing, we are heading to IKEA this weekend! OH HEY from two months ago. That one time we went to the corn maze. That time we went to Apple Hill. The pictures we took 3 months ago.